July 22nd, 2015. The first poster for G-Comic Manga Booster 01: Leaders & Deletors was made public today through Bushiroad's official Japanese Cardfight!! Vanguard Twitter account, teasing several units from the first Comic Booster of the G series. Intended to feature Ibuki Kouji's Deletor cards from Itou Akira's ongoing Cardfight!! 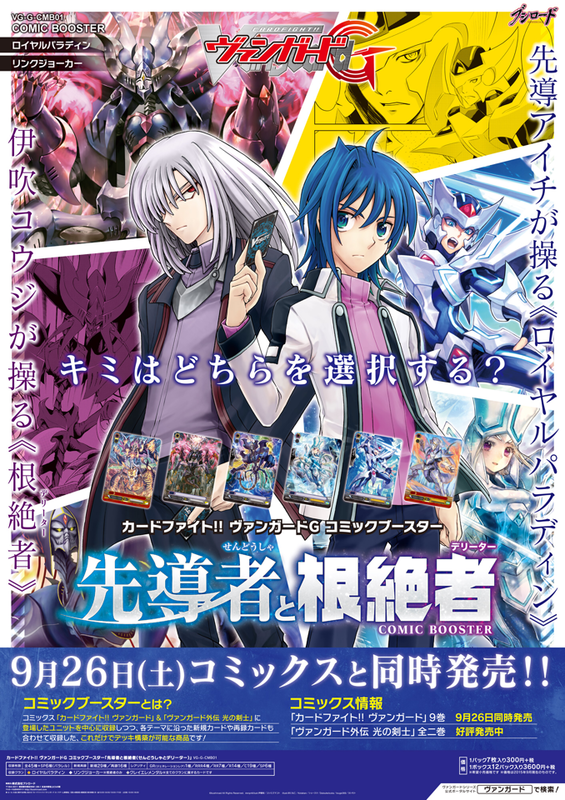 Vanguard manga, and Sendou Aichi's Alfred cards from the same series, the booster set will also include units featured in Koshimizu Makoto's Cardfight!! Vanguard Gaiden: Shining Swordsman manga. While Koshimizu's Gaiden manga has yet to be licensed by any western publisher, Itou's manga has been licensed by Vertical Inc. The seventh volume will be published in English this August, while the eighth volume will follow in early November. The poster most prominently features Ibuki's signature grade 3, Docking Deletor Graywon, as well as Aichi's Blaster Blade. The poster also teases what appears to be a stride revival of Daunting Deletor Oksizz on Ibuki's side, and the Shining Swordsman character Lola--Blaster Rapier's past self. Leaders & Deletors will include 45 different cards, 16 of which are reprints from previous sets, and will only include support for Royal Paladin and Link Joker. The set's tagline is "Which will you choose? To command Ibuki Kouji's Deletors, or Sendou Aichi's Royal Paladins." Itou's manga, which served as the template for the animated series and first debuted ahead of it at the 2010 Tokyo Toy Show, has gained steady popularity internationally. Most recently the title received a cross-promotion with the LINE messaging system, making Cardfight!! Vanguard manga themed emoticons available to users. G-CMB01: Leaders & Deletors will launch on September 26th 2015 in Japan. No international launch date has been announced at this time. Today's article was made possible by the donations of our patrons at Patreon. Cardfight Pro is funded by public contributions from readers like you.